The Android OS is an open source platform which gives room to lots of customizations, modification, tweaking and it's also one of the few platforms that allows you to install apps from third party source. Why this might be an advantage to the Android users over other mobile operating systems, it also comes with lots of disadvantage. The porosity of the Android platform makes it a major target for cyber criminals. 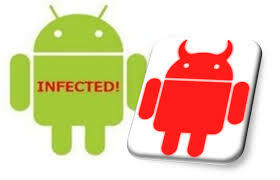 One of the worst things that can ever happen to your Android smartphone is malware infection. Any Android smartphone that gets infected becomes almost useless with time as the malware gradually spread around your smartphone thereby taking over most of your phones activities. Some people's device have been infected by malware but they don't know how to detect it. So in this post I will be explaining in details 7 different signs that will show if your device has been infected or not. =>1. Automatic Installation of Spam Apps. This is one of the most common signs and most times it's the first thing that happens when your phone gets infected. If you start noticing strange apps that you don't remember ever installing on your device then there is a great chance your phone has been infected. Most of this apps are almost impossible to uninstall as they automatically change to system apps. It is advisable at this stage to disable"Allow installation of apps from Unknown sources" from security settings, before searching for a permanent solution. when your Android smartphone gets infected, your phone will always be filled with irrelevant ads, irrespective of what you are doing with it or whatever app you are currently using. You will always get frequent pop-up ads whenever internet connectivity is available. Of course before ads can appear on your mobile phone, internet connection must be available and that is one of those things cyber criminals try to take care of when attacking your smartphone. So most times another thing you will notice when your phone is infected is that both your mobile data and WiFi turns on by itself. Sometimes it also affects the Bluetooth. No matter how many times you try to turn them off, they will always come on again automatically. If it happens that your data connection always comes on by itself and unwanted spam ads are always automatically downloaded then this will surely have an effect on your data usage. So if you notice a strange increase on your data consumption. You might want to check your data usage settings just to be sure if the increase in data usage was caused by your increase usage or some apps you rarely make use of as malware can also lead to situations like that. If you by any chance let malicious apps gain access into smartphone, Then they literally take control of your device by constantly installing unwanted apps automatically and also pushing pop ads to your phone. When this happens, you will notice that your phone will start hanging more than it used to and the general performance of your phone will continue to reduce everyday by day until your phone becomes almost useless. It's normal for most phones to get a bit hot when using it a lot. But it's abnormal when your phone starts overheating even when you are not using it at all. If you start noticing this on your smartphone, you might want to clear up unwanted apps and make sure you always kill background apps when not in use. But if it still continues there might be malware on your phone which runs in the background even when you are not using your phone. When you have malware installed on your phone, it will always run in the background even when you try installing app killers, they won't be effective on them in any way whatsoever. When this happens, you will surely start noticing most of those signs mentioned above like your phone lagging or overheating which will affect your battery performance. So if you notice a sudden drop in your phone's battery performance then it might either be that your battery is bad or you have some malicious apps draining your battery in the background. So guys here are just few major signs you will notice when your Android smart device gets infected. The really good thing about this is that you can actually prevent your smartphone from being infected by any of the malware out there. I recently posted an article on fee safety measures to prevent your phone from getting infected, but In case you missed it then you can check it out by clicking on this Link.